Wales battled all the way, but could do nothing to stop France recording their best ever win in this fixture. France recorded nine tries in a 52-3 win against Wales in Montpellier – their highest score ever against Wales – dominating the game from the start. From the first scrum the Welsh pack was put at huge pressure. From that penalty, France kicked to touch on the 5m line and from the lineout drove over, Caroline Thomas getting the touch. Five minutes had gone, France were 5-0 ahead – and the mountain Wales were faced with was clear. An exchange of penalties followed, but most of the play was at the Welsh end. Wales defended their line with great determination, but inevitably France eventually found a way through, Safi N’Diaye finding the gap. 13-3. After 32 minutes Caroline Thomas scored an absolute replica of the first try, extending the lead to 18-3, before in the final minute of the half a great break down the touchline by Ian Jason took France back into the Welsh 5m where a perfect cross-kick by captain Gaelle Hermet allowed Léa Murie to score the bonus point try. France lead 23-3 at the break. Pauline Bourdon was everywhere in this game, and it was a brilliant step by her that lead to a fifth try soon after the break. Pauline herself was tap tackled just short of the line, but Romane Menager was on hand to score. Ten minutes later Menager scored her second try, and perhaps the best of the game, her power, strength and speed breaking the Welsh line before sprinting to the posts. 35-3, 51 minutes gone. Six minutes later Caroline Thomas scored her hat-trick try with a third, carbon copy, score from a 5m lineout. 40-3. 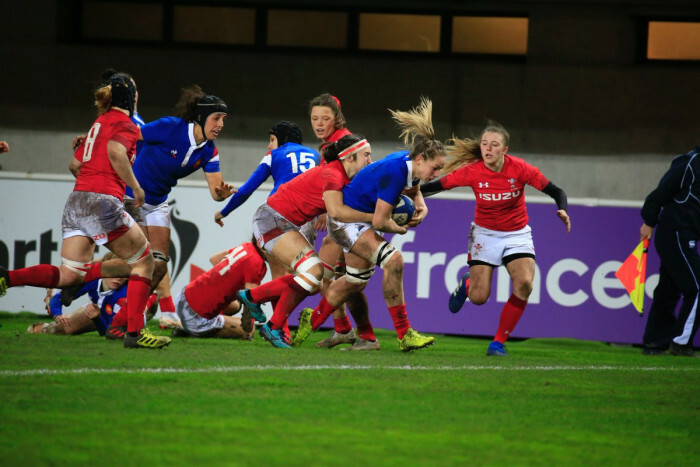 More heroic defence by Wales followed, with occasionally for a foray into the French end, so it was not until the final play of the game that France scored their ninth and final try Léa Murie ending the game as she had ended the first half. So a good start for France, but the real test will be next week against England.